Behavioral segmentation is a marketing tactic where consumers are divided into separate groups and delivered unique content based on the actions they’ve performed in the past. When it comes to email marketing ideas, behavioral segmentation brings endless possibilities that boost every metric from open rate to conversion rate. “Email is dead!” is the mantra among marketers who haven’t found success by using the same old email marketing ideas time and time again. In actuality, the onset of behavioral segmentation has created an entirely new, analytical approach to email marketing that’s given the field new life. Today, we’re going to talk about segmentation with a focus on behavioral cues. We’ll show you a few segments you should watch and how targeting these can boost the profitability of your email marketing efforts. By dividing your email marketing list into multiple groups, called segments, you can custom tailor messaging strategies to align with the user’s interests. i.e. Send your customers different messages than your prospects. This type of basic segmentation is a common email marketing idea that’s been in practice since the inception of the industry. Opens: 14.91% higher than non-segmented campaigns. Unique Opens: 11.27% higher than non-segmented campaigns. Clicks: 55.49% higher than non-segmented campaigns. Using this data, we’re given a solid starting point for effective email marketing ideas. You know a little bit about who the shopper is and what, in a general sense, they might be looking to achieve through your business. Although useful, these cursory pieces of information don’t tell you much about a shopper’s intent. With behavioral segmentation, however, we dig deeper into the ‘why’ and ‘how’ of your consumer pool. By keeping a keen eye on users’ behavior as each moves through your site, you can get a greater understanding of individual user intentions and how to best match those intentions. Simply put, behavioral segmentation lets you more easily identify shoppers who are getting close to making a purchase. Let’s dig into the important aspects of behavioral segmentation and talk about a few segments that you should start watching right now. Believe it or not, before a customer moves about your site, they’re already volunteering important behavioral information that you can leverage into creating relevant content. Is this a recognized user? If not, prioritize initiating a dialogue. Consider using some sort of proactive engagement after a user has viewed a few pages. The best way to create a lasting relationship between you and the customer is to get an email address. As soon as a user lands on your page, determine the traffic source. If they’ve arrived through any promotional link you’ve sent out, then display the relevant content. If they’ve arrived organically from a Google search, then present users with your newest promotional material. Although great strides have been made to reduce site-wide abandonment, you’ll always have visitors who exit before converting. Thankfully, even these abandoned sessions leave you with some great information. Start observing trends among users who never add items to their cart. How many product pages do users view before exiting? By contrast, how many pages does the average purchaser view? Number of pages viewed can be a demonstration of purchase intent. Create a segment to message these shoppers with products related to products browsed. If a user abandons a particularly valuable cart, send out an email with a purchase incentive to sweeten the deal. If a user abandons a cart full of goods from the same category, they were probably comparing prices. Send some helpful reviews and help the user decide. If a user abandons one of your most popular items, let the consumer know that it tends to sell out quickly! The possibilities are only limited by your creativity. Think of strategies unique to your customer base and start testing! There’s a correlation between distance down the conversion funnel and intent to purchase. By the time a consumer brings a product into checkout, you can safely assume the shopper is interested in finalizing the deal. Those that abandon are valuable leads that you should pursue with emails. Making a purchase, though extremely important, is another in a long list of behaviors to monitor. A purchase is not a cue to stop your marketing efforts. What should you do after a customer has converted? Use the purchase as a milestone marker. Ask buyers for reviews a week or two after purchase. If you sell any kind of limited license or consumable good, send an email to get shoppers to resupply or resubscribe after the appropriate amount of time. Has the user returned to browse since their purchase? Send them a message thanking them for another visit and ask how their last purchase is treating them. This kind of special, personalized attention doesn’t go unnoticed! Behavioral segmentation is an extremely powerful tactic when approached with the right amount of creativity and analysis. The examples we’ve provided are really just the tip of the iceberg. So, next time you catch a marketer preaching the demise of email, remember that with the right segmentation, email is actually one of the most personalized, profitable, consistently relevant, effective marketing mediums. 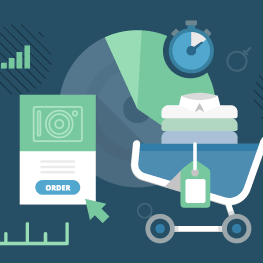 There’s a pattern to the average buyer and with some clever use of behavioral data, you can help shoppers fit that pattern, increasing conversion in the process. For more information on behavioral segmentation and addressing site abandonment, contact UpSellit!